A quiet afternoon of blowing bubbles and popping them turns into a Planes, Trains, & Automobiles, (and Helicopters, and Fighter Jets, and Moon Shuttles)-style adventure, as our young protagonist Dewey struggles to pop that one bubble...The Bubble That Got Away. 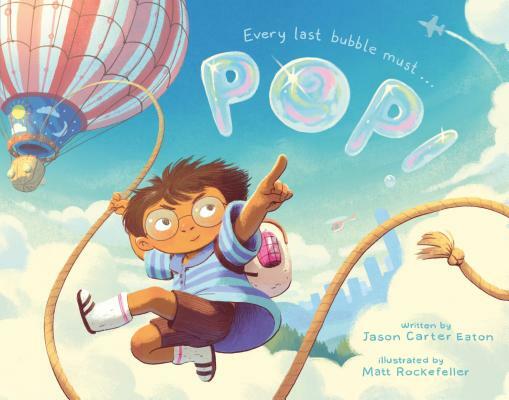 With luminous, breathtaking art from Matt Rockefeller that evokes both epic adventure and the pleasure of a lazy summer day; and a lively, wry, and suspenseful text from veteran picture book writer Jason Carter Eaton, Pop! is a picture book that will delight readers from cover to cover. Matt Rockefeller is an illustrator and comic artist from Tucson, AZ who loves to depict places and tell stories through pictures. His work has appeared in a variety of formats, including book covers, picture books, and animation. Recent books include TRAIN from Workman Publishing and the 5 Worlds graphic novel series from Random House. Matt received his BFA in Illustration at the Maryland Institute College of Art in 2014. Jason Carter Eaton is the bestselling author of numerous children’s books, including Great, Now We’ve Got Barbarians!, The Catawampus Cat, How to Train a Train, How to Track a Truck, and the middle-grade novel The Facttracker. He has also worked extensively in television and film, where he wrote the story for Ice Age: Dawn of the Dinosaurs. Jason currently lives with his family in Westchester, New York, where they have popped many awesome bubbles together.